Steamed Glutinous Rice With Coconut Jam or Pulut Tekan (Pulut Tai Tai) is another popular teatime snack in Malaysia and Singapore. 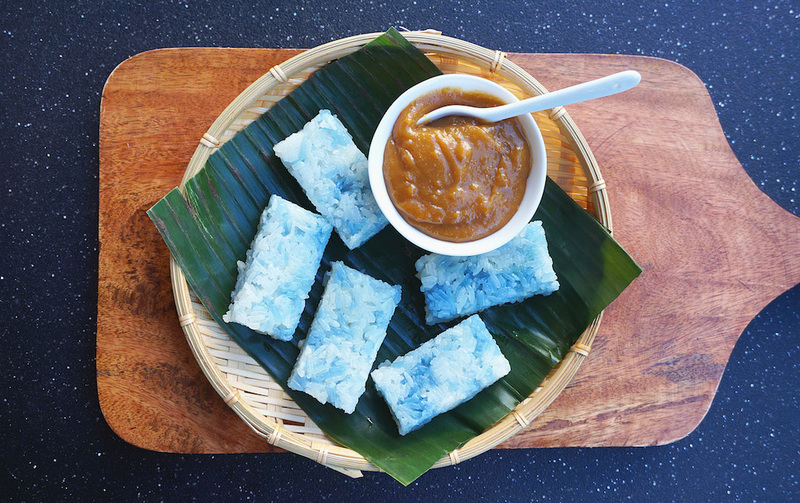 This dessert is rich with coconut infused glutinous rice and the natural blue color of Butterfly Pea flowers or Bunga Telang as known locally. It is served with some coconut jam. Blue Colour Rice: Soak picked dried Bunga Telang with 1/2 cup of boiling water. Let it rest for about 10 to 15 minutes. Drain and soak 100 grams of rinsed glutinous rice, overnight. Uncoloured Rice: Soak 300 grams of rinsed glutinous rice with some water, overnight. Mix coconut milk with salt, water and set aside. Drain both rice separately. Place them in a baking tin. Drizzle 200 ml coconut milk mixture all over the rice. Top with Pandan leaf and place in a steamer. Steam on high heat for about 20 minutes. Fluff the rice and drizzle the rest of the coconut mixture and steam for another 10 minutes. Remove from the steamer and discard the Pandan leaf. Mix the rice together with a pair of chopstick. Press the rice evenly with a spatula. Cover with banana leaves. Then ft in the cardboard and place a heavy object on top for 3 to 4 hours. Cut into desire sizes and serve with Kaya.